Villa Avalon is a superbly decorated and designed villa facing south over the Raven canal - perfect for relaxing beside the pool in the spacious lanai. Built and landscaped in November 2002, remodeled in 2013 ,the property remains in brand new condition and is ideal for upto 2 families to enjoy together, yet comfortable for a couple requiring a get away break. The design offers exceptionally versatile accommodation with both formal and casual areas for entertaining and relaxing. Sliding doors give access to the lanai and pool from the master bedroom, lounge and family room. The villa extends to a total 2800 sq.ft, air-conditioned with a swimming pool heated by an energy efficient heat pump. The villa has a boat dock and 7000lb lift, it is 15 minutes to the Caloosahatchee river by boat, ideal for the keen boater. 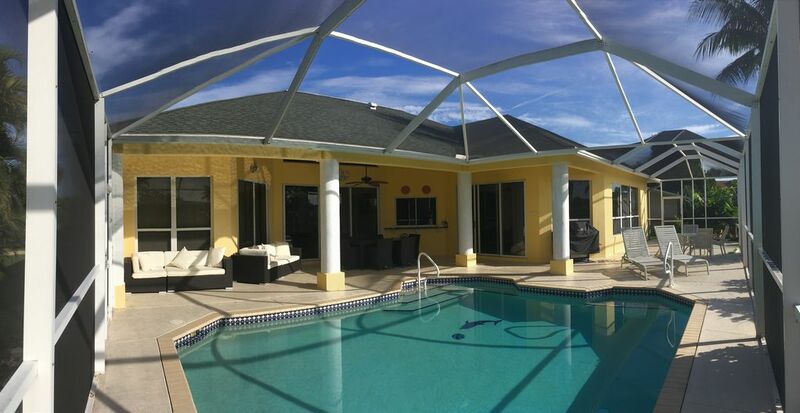 Situated in the Country Club area of Cape Coral this villa is 5 mins drive to the Yacht Club beach and 25 mins to Fort Myers airport. The rate includes the use of Sea Ray 240 Sundancer, a boat and area familiarisation is require and a payment is $130 is made directly to our boat Captain for this. My wife and I had a wonderful time at Avalon. The house was clean, well kept and beautiful when we arrived. Captain Tom is a really great guy with an expertise in boating and the local area. We were definitely not ready to leave and would certainly stay there again! This is a beautiful home with a great patio that we enjoyed every day. We appreciated the welcome package they left us when we checked in. Everything was clean and we had everything we needed. The house is perfect for two families. The owner is very nice and has a team of people that are available if you need anything. And a special shout out to captain Tom, he was great! We will definitely rent this property again. This property is everything it says it is! It is located on canal about 15 minutes by boat to the river. There is plenty of room for 8 people. Pots, pans, coffee maker, spices galore. The best 2 things are: Management company (Donna) and Captain Tom-who provides familiarization of the boat, the canals, and the river. We had a wonderful time. The home and property are beautiful and very well maintained. We enjoyed the pool and the boat. Captain Tom was very knowledgeable about everything with the boat and waterways. We took the boat out daily. We have 5 little ones and the size of the boat was perfect. The house has everything you need, including beach days. We visited Sanibel one day, which was a short drive and well worth the trip. The management company called and checked on us and gave restaurant recommendations. Shopping is close to the home. We stayed during the Fourth of July and you could see the whole firework show from the back yard. We also enjoyed fishing off the dock and one morning watched manatee playing, we even got it in video. We had a wonderful vacation and will definitely be back. Three adults and four kids (8 to 15) stayed here and it was super comfy and roomy. The house was large and had everything we needed. The pool and lanai area was great and spent most of our time outside there. The BBQ was a very large and high end Char-broil grill with no flare ups and smooth heating. The boat was awesome, ran great and, Cpt. Tom will ensure you feel confident to operate the boat and know how to navigate the canals and river. Fish (mullet) are always jumping in the canal which kids love to watch. The area of Cape Coral is so beautiful and relaxing. I retire in three years and cape coral is a good contender. For all you Jersey and Phila vacationers, Papa Joes has awesome pizza and there is a Ritas Italian Ice there. Overall had a great time, it was easy to reserve and pay. There are no hidden items everything is straight forward. The owner responds in a very timely manner as does his management team if you need them. I called Jason one time about the pool and he called me back within a few minutes. Nothing to worry about here, just reserve it and Enjoy. I just want to say I was very impressed from the time we set foot into the house. Everything was clean and the outside was very manicured. Very tasteful deco. The study has a bed in it so all in all its actually a 4 bedroom house. The beds were comfortable too. There was everything in the kitchen for your use you could think of. Also lots of towels and linens. There was even breakfast items waiting on us! What a special touch. We enjoyed the boat very much. Captain Tom was amazing. The pool was heated but we didn't get to use it much. I can't say one bad thing about this place. Grocery and shopping was close. We made a few trips to Sanibel which wasn't too far away. I would definitely return!! You can tell this house has been very well maintained.